When considering the leadership as a major family group or its business assets, the longevity of success comes from thoughtful long-term planning around succession. "The generations of living things pass in a short time and, like runners, hand on the torch of life." - Lucretius, Roman Philosopher. When considering the leadership as a major family group or its business assets, the longevity of success comes from thoughtful long-term planning around this question on succession. To give you an example, one day, a major family group’s patriarch (a client of mine) and I were having this conversation, when we were discussing the appointment of a new family CEO. In this instance, it was the daughter-in-law, who had been appointed and in conversation with her it was clear she was extremely excited (according to the patriarch) for the role. But the first question my client asked his daughter-in-law was, “who is your successor?”. It wasn’t even 10minutes into her newly appointed role and this client was openly asking her if she had thought about “who is next?”. And while some may think this is the last question you would ask in that context, I think such a question is most definitely necessary so soon. Well, there is a pretty clear outcome that all leaders have to consider in their role as CEO and that is; how can they steward what has been created, meanwhile create value themselves and then ensure an orderly transition of that value created to the next generation? Also, in the case of the patriarch, he wants assurances that long after he is gone, there are processes in place that instil a legacy-based mentality amongst leader, after leader, after leader. Meaning he wants confidence that the leadership torch is passed from one generation to the next in the most frictionless and value-aligned manner. Currently, as we look at family leadership and the transition of wealth in a broader sense, I think we can all agree that there is a large-scale succession occurring globally. Where across places such as Australia, the Middle-East, UK, US, Asia, major family business and hundreds of billions in wealth is hitting a generational cliff. So, the need to deeply consider and plan the right governance transition strategies is critical for this wealth to live beyond the generation previously. Meanwhile, as we observe the countless Unicorn companies now IPO’ing (Uber, PagerDuty, Slack, Spotify, Pinterest to name a few), there is a new wave of major wealth set to be realised, with more than 500+ billionaires to be created via these liquidity events in 2019, which will allow for again another wave of major wealth to join the scene. And with this new wealth created and old wealth transitioned, processes need to be instilled to ensure this wealth continues to grow, not stagnate or dissipate. As quoted above, from Shirtsleeves to Shirtsleeves in 3 Generations. This speaks to the creation, stagnation and dissipation of wealth and statistically, families who have such wealth often fail to use the wealth effectively through those generations to utilise them as strategic levers to support a long-term multi-generational wealth succession plan. Whether it’s poor communication or relationship building from the leadership, conflict amongst siblings, conflict amongst patriarchs/matriarchs, differing views of direction with kids, challenges from the leadership, ego, pride or lack of humility. The idea of succession is exceptionally complex and fraught with dangers, which can be mitigated with the right leadership transition strategies in place. 1. Lead by Affinity, Not Blood-line. Families that live out effective succession have a clear definition of humbly living out who they are. Family is defined as; "one or more people who are not only linked by blood, but also through affinity and they act from a deep purpose and philosophical-base and they transition that purpose as an open-human system from one generation to the next”. How this plays out in reality is; such families and their leaders, focus on supporting and enhancing the individual family members by helping them have space to discover and monetise their passions in a scale-able, profitable and sustainable manner (think like a sandbox for start-ups). Once unearthed, this effectively allows for new wealth creation opportunities that injects fresh energy into the core family assets, avoiding the stages of stagnation and dissipation, but leveraging existing with to enable opporuntiies for dynamic preservation. So, as the torch bearer, it’s your responsibility, like any FaCEO to not only consider strategies to deliver external value in the time you carry the torch, with sound portfolio management but it’s also about empowering the other individual members, giving them that environment to discover where their passions lie (using coaches/mentors/trusted advisors), then nurturing that passion, which leads to its commercialisation. As once they [the family members] have that clear product-market-fit, which aligns to the direction they have for their life, a leader’s responsibility can then become so much easier as they can then know what the resources required are to build out sustainability within that individual’s life. Interestingly, it isn’t uncommon for 1st generation wealth to do this, but they consider the support in a compartmentalised manner, where they (based on my observations), in the instance of a couple or family unit to give the entire focus and attention to the “blood-line” family members, but not support the “married-in” members. If you observe the most successful families of our time, this approach is quite-counterproductive, as families that link their leadership and wealth by blood-alone not by affinity creates closed loop systems that removes the new energy and skills, which new (married in) family members typically provide. But then, how do we create our own family affinity? So it is pretty important to ensure that the family has a clear, open-based family system where all members and its leaders live out a positive, profitable and sustainable lives, which as parts, contribute to the family mission, as a whole. You have to allow innovation, even if you don't understand it in the now. - Roland Mack. And once that is achieved and we have everyone living out positive relationships for the betterment and growth of the family group, we can then look at strategies to support the sustainability of this. Such a strategy can include drafting out an internal vision and a mission statement as a family. This is very common amongst major family groups (and provides that deep philosophical base to exist from). Like in the times of Ye-Ole, England. There were and still to this day exist families who live out their family crest and all it represents. Also, within the strategies to realise these statements through action, once implemented supports the lifting up of members out of the trenches of their lives and gives that 30,000 feet view and opportunity to test their actions via a feedback loop, "as parts" within the family group, as the whole. The methodologies that bring about this outcome are not too dissimilar to organisational and leadership-based approaches found in the corporate world. Although, given the complexity and added time, which outcomes take to come to fruition in family groups. Recognising this and building strategies in the context of the family themselves is critical. It’s important to note that, no one strategy will fit all sizes and recognising this, as the leader, whether you are the Patriarch, Matriarch or nominated children/in-law or independent family CEO, there will be the need for you to live out values of patience, humility, coupled with a willingness to always look through the lens of every other individual member. So in summary, when it is all said and done, yes there are countless strategies to deploy, but the core of a family living in true affinity, lies in genuinely positive relationships, communication and a leader-led fostering of a clear open-system to create value and relationship amongst all members of the family. From studying multi-generational wealth such as, the Walton Family, Bernard Arnault & Family, Kamprad, Rockefeller Family and in my own advisory for major families in Australia, it’s clear, that the real possibilities open up when this idea of affinity is lived out. 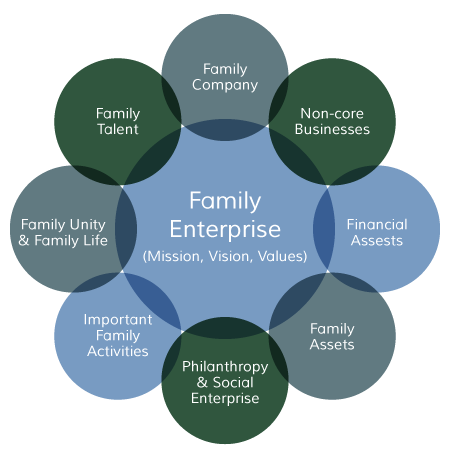 All of which, greatly supports the value creation and transition of leadership within major family groups from one generation to the next. 2. Apply principles of dynamic preservation and succession of assets. Next, for leadership to take the torch and successfully carry it into the next generation (and then transition thereafter), the family must be committed to living out agile strategies that supports preservation and succession allowing for new opportunities and risk to be taken. As history has shown us (and what financial advisors often advise), is when liquidiy events occur and wealth realised a matriarch or patriarch will typically establish trusts and appoint independent trustees to support the preservation of that wealth. These trusts typically support asset succession for 2 (at most 3 generations) beyond the life of the founding wealth creator. Paradoxically though, for families who want to defy the 3 generations proverb and increase the probability of building that legacy-based, family wealth, need to recognise that utilising such trusts and maintaining long-term control over the wealth and enterprise doesn’t actually provide scope for the necessary risk to be taken and allow for that outcome. Just as the wealth creator, whether it be a matriarch or patriarch, did, they took risk to create the wealth opportunities that have been afforded to the current generation. Then so too, in a strategic manner, should the generation and leadership taking the torch be allowed to do so also. While there are countless structures that can be applied here. The most important principle to instil within the leadership is to apply “seventh generation thinking”. This isn’t something I came up with. But has been a critical anthropological observation amongst tribes and the birth of civilisation itself. Where groups of people since the birth of time recognised that their ability to maintain a core philosophical reason for existence and survival came when the tribe became its own human system for the next 140 years. And with the study of anthropology comes the evidence that this only happens over seven generations. Therefore, to live out this thinking means to create a vision, which by affinity far outlasts any individual’s life-time (the next 140 years). By living this out an open-human system forms, focused on enhancing the growth of its members, beyond preservation but into habit, routine and lifestyle. Such a mindset then allows for sound, strategy based investment strategy and risk to be taken, which in turn provides increased chances of new and greater wealth to be created. See Infographic at the end of this article for more unpacking of this thinking. As a leader carrying this torch, taking into account and embedding this thinking without pride or ego, will greatly support not only the overall wealth creation opportunities that will come long after you are gone, but also will build a system of open and positive relationships amongst, sons and daughters, in-laws, grand-kids and all other extended family that will make for such a fruitful life. 3. Ensure everyone buys into the vision and are committed to succeeding together. Finally, as a leader in this situation, you will recognise that whether you are family, carrying the torch or you are an independent CEO taking the torch that family governance is complex and there is no “one size fits all” structure. And getting family members to work together will always have its challenges and take longer than anyone thinks, think herding cats. So, by creating short-term action-based, joint-decision making opportunities, you will provide scope for momentum to build and habits to form. As the truth is, those that know they can make decisions together successfully at a small scale, will more likely be willing to tackle grander and more difficult decisions together in the future. Considering the below tiered hierarchy and building out those opportunities to bring together the members to make decisions within the below time frames, meanwhwhile establish team orientated actions from those decisions will create habits, routines and lifestyles aligned to the vision and over-arching affinity. Importantly though, as I have banged on, without the clarity around the affinity and a willingness for leadership to take the lead, communicate and create the space for all individuals to flourish, all these actions, while building momentum, will not solve that root issue of affinity and building out the seventh generation thinking. Another example, from the trenches of family advisory. In this case, I advise a large family group, 6 kids across 2 marriages. The patriarch lives out a successful life, but never really quite understood new-generation thinking and while a successful business man in his own right, doesn’t recognise how business has changed years on. As such, he would regularly ask “loaded questions” with expectation around the answer with thinking through his own mental models and lenses of how he thinks business operates, not through the lens of the new thinking. And if the answer he received wasn’t what he hoped, he adopted a closed, non-communicative response, forming his own views and presuppositions around what he expected. The result? The patriarch one day, accused the adult child of all these wrongly formed assumptions, not trusting in their ability and their smarts, then cutting off the child to the family wealth, but more importantly this created a fracturing of the positive relationship required for an open-family-system. You see, in this real case-study, the core of the family needs to be selflessly driven by the leadership and cannot be built on pride, but on that purpose greater than the individual - the shared vision and family mission. You cannot under-estimate the impact of such fracturing and while is mendable, requires the relationship building to come first before strategy elsewhere comes into play. While this may be an extreme case, recognising the impact, poor communication has in any circumstance, can always snow-ball into something toxic. And when considering this and the wider elements of family, it's critical to identify that this short-term decision making strategy and the structures around governance and succession only works when there are open and authentic relationships, living throughout the family system as a whole. At the crux of it, this is how the passing of the torch can occur seamlessly. Now, we can talk about this at length and I apologise if this seems broad, but the context of each major family group is driven by intangibles that only ample discovery on the family specifically can provide. It is then by grasping that understanding around their vision and mission can we then identify the tangible strategies to build that legacy-based succession plan. To finish, whether you are a 1st, 2nd or 3rd generation wealth family (or beyond), where-ever you are on the journey, I hope you continue to build your wealth with commitment to that long-term vision, but with the care and love for harnessing the expertise and new perspectives your children (and their families) bring. The centuries of major family success speaks to the cornerstone being a family-based, open-system approach, as this is core to the birth or reinvigoration of sound family governance and the seamless passing of the torch from one generation to the next.